Avocado is the fruit of horticultural cultivars and has a markedly higher fat content than most other fruit, mostly monounsaturated fat, and as such serves as an important staple in the diet of consumers who have limited access to other fatty foods (high-fat meats and fish, dairy products). Having a high smoke point, avocado oil is expensive compared to common salad and cooking oils, and mostly used for salads or dips. A ripe avocado yields to gentle pressure when held in the palm of the hand and squeezed. 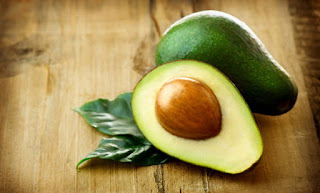 The flesh is prone to enzymatic browning, quickly turning brown after exposure to air.To prevent this, lime or lemon juice can be added to avocados after peeling. Here are health benefits of avocado, that are supported by scientific research. ~ Vitamin K: 26% of the RDA. ~ Folate: 20% of the RDA. ~ Vitamin C: 17% of the RDA. ~ Potassium: 14% of the RDA. ~ Vitamin B5: 14% of the RDA. ~ Vitamin B6: 13% of the RDA. ~ Vitamin E: 10% of the RDA. Fiber is indigestible plant matter that can contribute to weight loss, reduce blood sugar spikes and is strongly linked to a lower risk of many diseases. A distinction is often made between soluble and insoluble fiber. Soluble fiber is known to be able to feed the friendly gut bacteria in the intestine, which are very important for the optimal function of our bodies. Heart disease is the most common cause of death in the world. It is known that several blood markers are linked to an increased risk. This includes cholesterol, triglycerides, inflammatory markers, blood pressure and various others. ~ Reduce total cholesterol levels significantly. ~ Reduce blood triglycerides by up to 20%. ~ Lower LDL cholesterol by up to 22%.